Hello everyone! This week I thought I'd do something a bit different to my usual post since I've been nominated by Anael (click to see her blog) for the One Lovely Blog Award. I'm sorry that I'm not doing a tutorial or sharing my recent creative projects, but I've been busy recently with revision and my school art project so it's great that I can show you my entry for the award this week. In two weeks time, I'll be back to normal with an arty post! 1. Compose a post based on the award. 2. Nominate up to fifteen bloggers. 4. Inform your nominees about their nomination. When it comes to films my preferences are split in two! On the one hand I love to watch typically 'girly' films such as rom-coms and musicals like 'Grease' and 'Mamma Mia'. But on the other hand, from time to time I like to watch horror movies and action movies. I guess that's a little strange liking films that are so opposite but perhaps I just love films in general! Ooh and I love a good ol' Disney film! My favourite book series is Ruby Redfort by Lauren Child; I've read her (Lauren Child's) books ever since I was little starting with Charlie and Lola, then Clarice Bean and now Ruby Redfort. I've finished the last book in the series now! I think I'll re-read them at some point. I don't go to any clubs outside of school, but inside the school day, I go to an art club and a reading club. At the moment I'm taking part in the Carnegie award (in the book club) which this year is supported by Amnesty international so all the books have the theme of human rights. I think my favourites so far are 'Salt to the Sea' and 'Bone Sparrow'. I'm obsessed with stationery, particularly washi tape at the moment is the which I keep buying more of! But anything like pens, pencils, scissors, sticky notes, rulers, rubbers, washi tape, stickers etc I'm all over! My favourite places to shop are: Paperchase, LUSH, Accesorize, The Body Shop and The Range (the Arts &Crafts section). I'm also a little bit (OK very) obsessed with pineapples and watermelons (and the odd strawberry or two hehe). I don't really mean eating the fruits (although that's nice too) but I mean decorating with pictures of the fruit. I have notebooks, sticky notes, bunting, clothing, you name it-all covered in fruity patterns. I would nominate Beth May as well but she's already been nominated. Don't worry if you don't have time to make this post or don't want to or aren't active anymore, I don't mind if you don't enter. But I hope that you have fun if you do enter! Once again thanks for the nomination Anael! 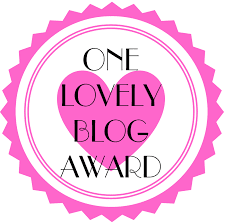 Have you ever been nominated for a blogging award? What was your experience? Let me know below in the comments. If you weren't nominated for the award, why not tell me a few facts about yourself in the comments instead? PS: Aargh technical issues: why won't the picture show up central and why is the text highlighted white?! PPS: Do you like my Summer background-I think it's a bit too busy but oh well. I drew the pineapple and banana leaf myself but the flower is from Pic Monkey. Thoughts? Your welcome for the nomination! I love the background - is Pic Monkey free? How do I use it? The facts you've shared are really interesting, it's fun to hear about your hobbies! About Lauren Child's books, that's awesome because I grew up on both "Charlie and Lola" and "Clarice Bean" too... I haven't got round to reading the Ruby Redfort series though but I'd love to! I noticed about the pineapples and I think they're a fun craze! It's also funny you mentioned this as a fact because I just bought some pineapple stationery today (some are a gift for my friend since it's her birthday... I was thinking it would make a cool summer aesthetic and I had your gift-giving post in mind :D). Hehe, I tend to write F.R.I.E.N.D.S too but I guess I didn't write it like that on this post since I was writing quickly. I love it because it's just familiar and funny and the character's storylines are interesting. Ooh you should read Ruby Redfort, it's so good! It's mysterious and intelligent enough to be worth a read but also Ruby's personality is quite entertaining like the little phrases she says! The carnegie award was really great for me, I hadn't read for a long time (even though I'm quite a big bookworm-I guess my other hobbies took over) but doing the award reminded me of why I love reading so much and has encouraged me to carry on reading afterwards. Not all of the books were my cup of tea but there were a few that surprised me (e.g Salt to the Sea is a story about war, which I din't think I'd enjoy but I loved it). Salt to the Sea won by the way which was great! Ooh where did you get the pineapple stationery from?